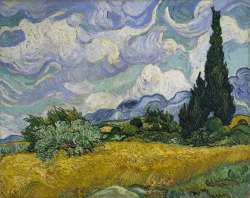 The art world, always replete with rumors, has been simmering for weeks with talk about paintings whose provenance might be marred by Nazi plundering, including one of the Metropolitan Museum of Art's biggest treasures, van Gogh's "Wheat Field With Cypresses." Doubts about "Wheat Field" have persisted since 1993, when Walter H. Annenberg gave the Metropolitan $57 million to buy the golden windswept landscape. They intensified in January after two families claimed ownership of two Egon Schiele paintings on view at the Museum of Modern Art, stoking the hunt for Nazi-tainted art. As always, the questions were abetted by the secrecy about past ownership (and price) that is a way of life in the art trade, and the somewhat less than rigorous attitude toward provenance that necessarily results. "Wheat Field" was bought from the son of Emil G. Buhrle, a Swiss industrialist who sold arms to both the Nazis and the Allies in World War II and whose collection contained some known looted works. When it was acquired, the Metropolitan traced its provenance on paper only through 1939, when its owner was identified as Franz von Mendelssohn, a Berlin collector and descendant of the composer, whose works were shunned by the Third Reich because of his Jewish roots. The painting's ownership record picked up again in 1951, when it was sold by a Swiss dealer to Emil Buhrle, who on his death in 1956 left it to his son, Dieter. Exactly what happened between 1939 and 1951 was left to one's imagination. Gary Tinterow, the Metropolitan's curator of European paintings, said he was confident in 1993, after making his usual sweep of art world sources and people who knew or whose parents knew the von Mendelssohns, that the family had sold the painting in 1951. But he did not try to get in touch with the von Mendelssohn family. "I didn't know anyone was alive," he said. But there are several grandchildren in the United States, and the existence of one, a retired doctor named Peter Witt, should lay the rumors to rest. Franz von Mendelssohn died before the war, and while his widow and five children spent the war years in Sweden, their paintings were kept by a friend in a house outside Berlin. After the war, Dr. Witt, who lives in North Carolina, inherited "Wheat Field." A Swiss citizen, he took the painting with him when he emigrated from Germany to Switzerland in 1949 and sold it, among other works, to Buhrle in 1951. "We needed money, and he was the only person who had the cash in his pocket," Dr. Witt recalled. He said he could not remember how much Buhrle had paid, except that "it was quite a large sum." He had no idea the painting was now in the Metropolitan or that it had fetched $57 million. The Metropolitan was equally surprised to learn of Dr. Witt when informed of his existence by a reporter. But Mr. Tinterow said: "As happy as I am to learn about Dr. Witt, I wasn't at all nervous about this painting. I acted responsibly in 1993, and you found Dr. Witt and happily he could confirm what I thought was true." Still, Mr. Tinterow agreed that where provenance is concerned, times have changed. "Today's perspective is different than 1993's," he said. "New information is more widely known than in '93, with the opening of archives and with books being published on this. Today, we might ask, say, for more documentation to allay any concern about where this painting was during the war."